Heidi Talbot is a singer from County Kildare in Ireland, who spent several years in New York as part of the group Cherish the ladies. Her first solo album after leaving "Cherish the ladies" in 2008, "In love and light" got great reviews, but it wasn't till her 2010 album "The last star" that she started writing her own songs. Now she is back with her latest album, "Angels without wings" (her fifth solo album). As well as her usual team of musicians, she has two guests on the album, both of who are acclaimed guitarists - Jerry Douglas and Mark Knopfler. Amazingly they didn't just play their guitar parts in their usual style, but also recorded them in different styles - it's a rare thing to get a guest to appear on an album and to thenget them to play in a style that means it won't be recognised as them playing, but Heidi Talbot's approach is to use what suits the song best rather than using what's most recognisable as a particular musician. 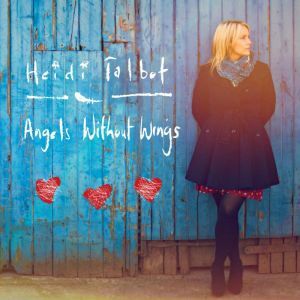 The songs initally sound quite simple and you're naturally drawn to focus on Heidi Talbot's lovely voice, but there is a lot of subtle detail in the music that you notice more and more as you listen to the album several times. The music is beautifully done so that it always complements and never distracts from the vocals, which means you focus on Heidi's voice and the lyrics. The accordion in the title track "Angels without wings", helps give the song a French feel to it - it really does feel that if the lyrics were in French you could imagine hearing someone play this in a Parisian cafe. It's a perfect example of how something fairly subtle in the music can really change how the song sounds. A great album that is definitely recommended. "Angels without wings" will be released on 18th February 2013 on Navigator records.